Created in 1958, ALGOL stands for Algorithmic Language. This was one of the first attempts made to create a programming language that could be used on different machines. Today, the use of ALGOL is minimal but the roots of many major programming languages could be traced back to it. COBOL–Common Business-Oriented Language–was created on 1959 and it found its use in heavy business systems like insurance, banking etc. Even today mainframe computers running in government departments, banks, nuclear power stations use COBOL and it’s still being produced and developed. Created in 1957, Fortran–named after Formula Translator–could be considered the first general-purpose programming language that was used for heavy-duty scientific computing. Today, it still finds its use among the scientific community, physicists, and engineers. Named after the programmer Ada Lovelace, ADA is an object-oriented programming language that’s extended from languages like Pascal. Developed in 1980, this programming language, is used in military and air traffic control due to its safety provisions. Created in 1964 and introduced in 1969, PL/I stands for Programming Language One. Invented by an IBM committee , this language lost its favor in 1970s. However, PL/I is still used in IBM System/360 mainframes due to IBM’s dominance in tech. Named after well-known mathematician Blaise Pascal, this language was created in 1968 that peaked in 1980s. One of the most popular descendants of ALGOL, Pascal is still taught as object-oriented programming at many places. Lisp, first created in 1958, stands for List Processing. It’s the second-oldest high-level programming language that finds its use even today. Talking about the contemporary presence, Lisp is a popular programming language in AI field. Designed by Dennis Ritchie, C is one of the most influential programming languages of all time. This portable language is known for its speed that can be used to access lower level layers of a system. 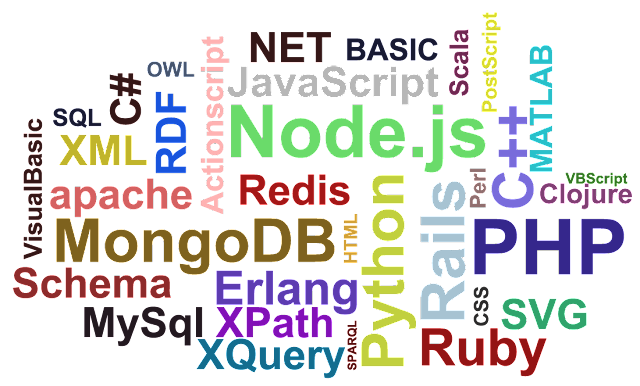 Mother of many other programming languages–Python, PHP, Perl, MATLAB–C is also used to write a large chunk of Unix, Windows, and Linux operating systems. C++ is a general-purpose and object-oriented programming language that was created between 1979 and 1983. There are tons of software–ranging from games, office suits, video players and even operating systems–that are written in C++. There are high chances that the popular software that you use in daily life are written in C++, C, or objective-C. Developed by James Gosling at Sun Microsystems, Java first appeared 21 years ago in 1995. It follows an object-oriented model and is simpler to use than one of its influencers C++. World’s most popular mobile operating system Android is written in Java. Also, Java continues to power millions of client-server web applications and establishes itself as the most popular programming language. C#, pronounced as C Sharp, was developed by Microsoft in 2000. It was designed for use in Redmond’s .NET framework. This simple and object-oriented programming language is used to build a variety of applications that target Windows environment. Invented by Martin Odersky in 2004, Scala’s was inspired by the criticism of Java. This general purpose programming language emphasizes a lot on functional and static aspects. It’s one of the most popular JVM scripting languages. Scala also finds use in data science. Created by Dutch programmer Guido van Rossum, Python was designed with an aim to write simple and readable code. Python is one of the most popular programming languages that allows one to write code in fewer lines. It’s a great language for teaching programming at school. Python is used by organizations like Google, NASA, Yahoo, and CERN. It also finds major applications in the scientific community, data mining, and AI field. SQL, or Structured Programming Language, was designed by Donald D. Chamberlin and Raymond F. Boyce. Originally based on tuple relational calculus and relational algebra, this special-purpose programming language is widely used as a standard for relational database management systems. Ruby–a dynamic, general purpose, and object-oriented programming language–was developed in 1990s by Yukihiro “Matz” Matsumoto. Influenced by Perl, Ada, Eiffel, and Lisp, Ruby comes with automatic memory management and supports multiple programming paradigms. Ruby, along with its web framework Rails, is used to create web applications easily. PHP was designed by Rasmus Lerdorf in 1994, PHP originally stood for PersonalHome Page. However, now it stands for Hypertext Preprocessor. This general purpose programming language is one of the most commonly used technologies in server-side development. It’s used to make dynamic websites and establishes itself as the backbone of WordPress. R is the most popular programming language when we talk about statistical computing, data mining, and mathematical data analysis. It was designed by Ross Ihaka and Robert Gentleman in 1993. Go, or Golang, was created by Google in 2009 to handle its backend servers and networking applications. Go is also an attractive tool to make automation tools for developers. This fast programming language follows Unix’s principle of “Do one thing. And do it well. Introduced in 2014, Swift was developed by Apple. This was developed as a replacement of Objective-C. Today, Swift is one of the fastest growing programming languages that finds its use in creating iOS, macOS, watchOS, and tvOS applications. Visual Basic is often taught as a first programming language today as it is based on the BASIC language developed in 1964 by John Kemeny and Thomas Kurtz. BASIC is a very limited scope language and was designed for non-computer science people.